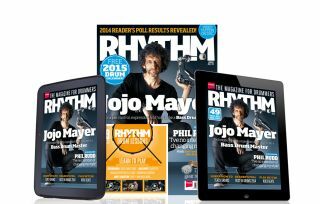 The brand new issue of Rhythm is out now and available to buy right here. The issue features a huge cover interview with the incredible Jojo Mayer. The master drummer discusses his long-awaited foot technique DVD, his own band Nerve and why drummers must embrace their role as 21st century artists. Plus: Your free Wembley Drum Centre 2015 calendar! Thanks this month's Rhythm tuition you can learn to play Soundgarden's grunge classic Jesus Christ Pose, Stop by Jane's Addiction and Jack White's Lazaretto. Plus there's all of your favourite video lessons from Pete Riley, Jason Bowld, Colin Woolway, Erik Stams, Kyle Cullen and Pat Garvey. This month you can win a place on a Tiki Drums snare building course worth £385! All of this and more is in the January issue of Rhythm, on sale now at all good newsagents, on the Google Play Store and Apple Newsstand. You can also get a great print and digital bundle. Get yours now right here.